Designed to clear snow using the back of the truck, the Drag Pro reduces the number of passes required with plow widths ranging from 8 to 16 ft. (2.4 to 4.8 m). 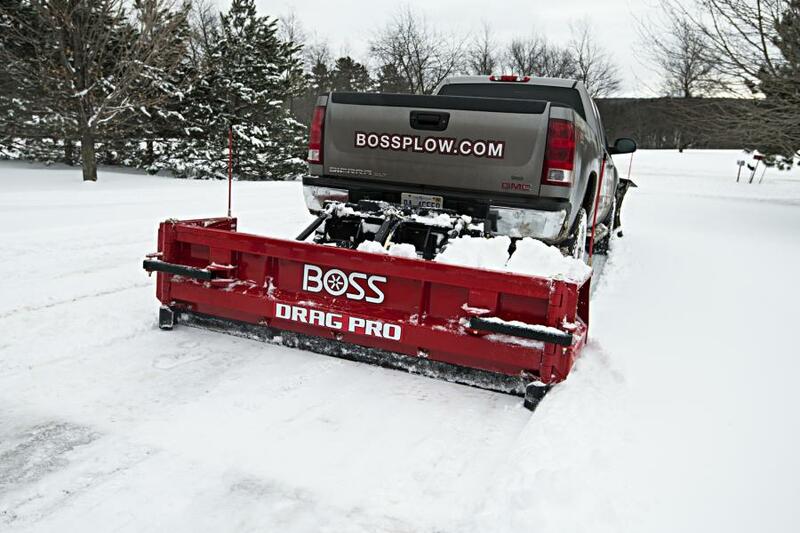 Boss Snowplow introduced the Drag Pro rear-mounted snowplow to improve productivity and efficiency when clearing parking lots, loading bays and residential driveways. Designed to clear snow using the back of the truck, the Drag Pro reduces the number of passes required with plow widths ranging from 8 to 16 ft. (2.4 to 4.8 m). Available in 8 ft. fixed wing, 8 to 12 ft. (2.4 to 3.6 m) hydraulic folding wing, and 8 to 16 ft. hydraulic folding wing models, the Drag Pro can open wide to maximize the area being plowed. The folding wing models are easily controlled via remote in the truck's cab.